The country of origin for this variety of goldfish is Japan. The shubunkin has a physical appearance that is very similar to that of the common goldfish. The country of origin for this variety of goldfish is Japan.They are often referred to as “the poor man’s koi.” The shubunkin has a physical appearance that is very similar to that of the common goldfish. They have bodies that are streamlined with well-developed even fins.The shubunkin was developed from variants of the telescope goldfish or Demekins. Different variants of the shubunkins are the American shubunkins, London shubunkins, and Bristol shubunkins. The London shubunkin was developed around the 1920s, almost the same period the American shubunkin was developed. The Bristol shubunkin came about as a result of crossbreeding the American and London shubunkin. The Shubunkin Goldfish, one of the more than 125 captive bred varieties, was probably developed in Japan around 1900. 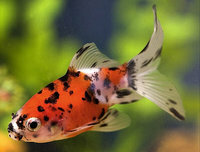 Other common names they are known by include Calico Goldfish, Speckled Goldfish, Harlequin Goldfish and Coronation Fish. Shunkins are sometimes called calico goldfish, because they have nacreous scales, which is a mixture of transparent and metallic scales that have a somewhat pearly appearance. The overlapping patches of black, grey, blue, brown, purple, red, and white, including dark speckles, are seen throughout the shubunkin's body extending also to finnage as well. Shubunkins that have blue colors are considered more valuable. Since they are omnivorous, the Shubunkin Goldfish will generally eat all kinds of fresh, frozen, and flake foods. To care for Shubunkin goldfish, keep a good balance by giving them a high quality flake food everyday. Feed brine shrimp (either live or frozen), blood worms, Daphnia, or tubifex worms as a treat. It is usually better to feed freeze-dried foods as opposed to live foods to avoid parasites and bacterial infections that could be present in live foods. Like comets and common goldfish, shubunkins are avid breeders and will often spawn regularly when left to their own devices in a pond. It is advisable to closely monitor pond population levels, as shubunkins can overpopulate them in a matter of months. A Shubunkin Goldfish can have so many colors to its pattern it is often referred to as the Calico Goldfish. These colors include yellows, oranges, reds, browns, blacks, purples, grays, and whites; and they are set on a blue background. Other descriptive names for this fish are Speckled Goldfish, Coronation Fish, and Harlequin Goldfish. The color blue is quite rare, which makes the Shubunkin a more valuable goldfish. The Shubunkin Goldfish are one of the most hardy varieties of goldfish and can tolerate temperatures a few degrees above freezing, as long as the cooling drops only a few degrees a day. A quick temperature drop can kill them, so if you live in a very cold climate a heater is advisable.